A Pittsburgh Plumber LLC Water Heaters Page. Water heater replacement services for all of Pittsburgh. Have a leaking or underperforming water heater? Have you turned on your hot water faucets only to find cold water? Does it take forever to get hot water to some parts of your home. Your hot water distribution system should be engineered to provide optimal service all the time. Big Box stores can offer you cheap and inefficient water heaters that are undersized and don't fulfill your needs. Why scrimp on something so vital to the comfort of your family? Get your water heater installed by a PRO. Get professional water heater installation in Pittsburgh from A Pittsburgh Plumber. 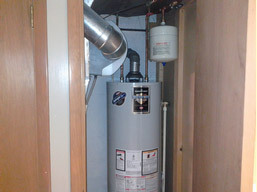 We are water heater experts at A Pittsburgh Plumber! Call Us Before You Dump money into a water heater that doesn't fit your needs. Hot Water distribution systems now come in many forms; instantaneous water heaters, tankless water heaters, point of use water heaters, and the old standard tank supplied water heater. Technology and convenience have finally come to the residential customer when it comes to options for your home. Water Heater Replacement Pittsburgh - Our water heater service technicians can explain the cost versus the benefit of upgrading your water heater and the savings upgrading provides. Put our 50 plus years of experience to work for you. All Water Heaters fail eventually. Usually at the most inopportune times. This can be due to material failure, poor installations, location and placement, and hot water distribution design. Rest assured when you call A Pittsburgh Plumber at (412) 341-7586 you will receive quality service and fair pricing. Typically, when a replacement water heater is installed, most just replace the water heater and nothing else is done to the plumbing system. With the changes in the plumbing code to prevent backflow and prevent the expansion of the hot water from harming your plumbing system or the public water supply, we provide you with the most timely and cost-effective solutions often for hundreds less than the leading competitors. Why wonder if your hot water heating system is designed right for your needs? Has your family situation changed your hot water needs? Have our hot water heater experts analyze your hot water needs and offer you solutions before you receive another underperforming installation. Call A Pittsburgh Plumber at (412) 341-7586 you will receive quality hot water heater inspection services and fair pricing. Our plumbing experts can provide options and design solutions rather than guess at what the problem is. The construction materials of your hot water heater have a large effect on how long your water heater lasts. Older water heaters could be serviced and worked on, but newer water heaters are mostly self contained units. This means they need repaired or replaced when they fail. Climate, usage, maintenance, and construction methods have a great deal to due with hot water heater failures. Today's top end water heaters are built and engineered to last many years if maintained properly. Call The HOT WATER HEATER INSTALLATION EXPERTS at A Pittsburgh Plumber for professional Pittsburgh Hot Water Heater Installation! Call A Pittsburgh Plumber anytime day or night for all your plumbing needs.